"A protein-filled smoothie with the flavor knock-off of Ben & Jerry's® blueberry and vanilla Greek frozen yogurt with a graham cracker swirl." 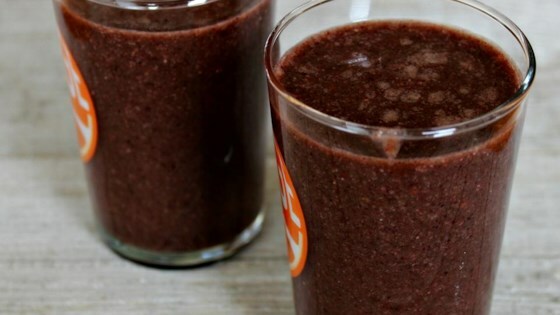 Combine coconut water, banana, blueberries, kale, spinach, dates, almond butter, hemp seed hearts, flax seeds, oats, and protein powder in a blender. Cover and puree until smooth. Top with graham cracker crumbs. Tahini or any kind of nut butter can be substituted for almond butter, if desired. Water or any kind of nut milk can be substituted for coconut water. Unflavored protein powder can be substituted for the vanilla protein powder. If you'd like your smoothie thicker, add a few ice cubes. If you like a smoothie that's a little runnier .. add more liquid. This made a pretty thick smoothie, so I added another cup of coconut water. Other than that, it was delicious for a protein shake! !